In an unusual rebuke to Kansas' secretary of state, a federal judge also strikes down the state's attempt to require prospective voters to provide documentary proof of citizenship when they register. “He who represents himself has a fool for a client” – Abraham Lincoln. Kansas Secretary of State Kris Kobach provided fresh proof of President Lincoln’s wisdom on Monday, as a federal judge ripped his handling of a suit challenging a controversial voter-proof-of-citizenship law he crafted and ordered him to take refresher classes on legal procedure. U.S. District Judge Julie Robinson’s stinging critique came as she struck down the law, which required prospective voters to provide documentary proof of their U.S. citizenship when registering to vote. The Kansas law was an attempt to counter provisions of the National Voter Registration Act, which allows prospective voters to register when they do business at state motor vehicle offices. Kobach vowed to appeal and asserted that the judge’s decision breaks with precedents set by the U.S. Supreme Court. Robinson’s ruling was no surprise; she earlier issued a preliminary injunction against enforcement of the Kansas law. Her rebuke of Kobach, who is running for governor and has been a high-profile adviser to the Trump administration on voting issues, was unusual however. The judge wrote that Kobach exhibited “a pattern and practice… of flaunting disclosure and discovery rules that are designed to prevent prejudice and surprise at trial. Because Kobach continued to break the rules despite her repeated warnings, “the court finds that further sanctions are appropriate,” she said. Under Robinson’s order, Kobach, a Yale Law School graduate, will have to complete six hours of refresher training on legal procedure. 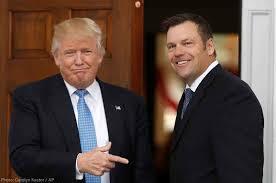 The ruling was the latest in a series of public setbacks for Kobach, who a year ago was vice chairman of a presidential commission created to bolster President Trump’s claim that millions of people voted illegally in the 2016 election. The commission was disbanded amid a firestorm of criticism over its request that states provide it with a wide variety of personal information about voters. Several academic and presidentially-commissioned reviews of voting practices across the country have failed to produce significant evidence of illegal voting.